I worked in a steakhouse for 12 years and there is always a debate about BBQ sauce. Thick, tomato-based sauces doctored to people’s taste. Some like it hot. Some like it sweet. A little honey. Maybe some hickory smoke. You name it. these versions seem to be more popular in the Northeast and parts of the southwest. Then there’s the other kind. It’s thinner and more vinegary. Half marinade, half sauce. Kansas City lends its name to this type of sauce. The same goes for spice rubs. You have the trinity: salt, pepper and garlic. Then you add regional favorites that will complement your BBQ sauce. 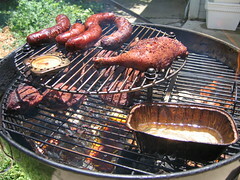 Kansas City or KC for short adds onion, oregano, brown sugar and a variety of peppers and nutmeg on occasion. The best way to season your meat with a rub is to brine or marinate the meat first then work the spice mix into the meat. They don’t call it a “spice rub” for nothing! After the meat is seasoned, grill or broil as usual. Serve with a side of BBQ sauce if desired. esh grown food as a focal point. . My hands-on programs and instruction helped hundreds of children and adults learn about where their food comes from and how important fresh food is for your body. Currently I’m a cook at a college in Pennsylvania. We prepare everything we can from scratch, including our potato chips that tout the seasoning of the day! Of course I write about food; it's in my blood!